with advanced ergonomic features and enhanced functionality. PIPETMAN® M is redefining pipetting with your technique in mind! The standard for accuracy and precision! Designed for both experienced and inexperienced users. PIPETMAN® M pipettes are intuitive and require no learning curve. 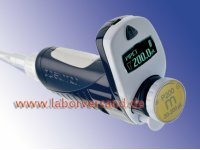 Covers the volume range of 0.5 µl to 1000 µl in only four models. Features adjustable speed piston and an universal tip holder.